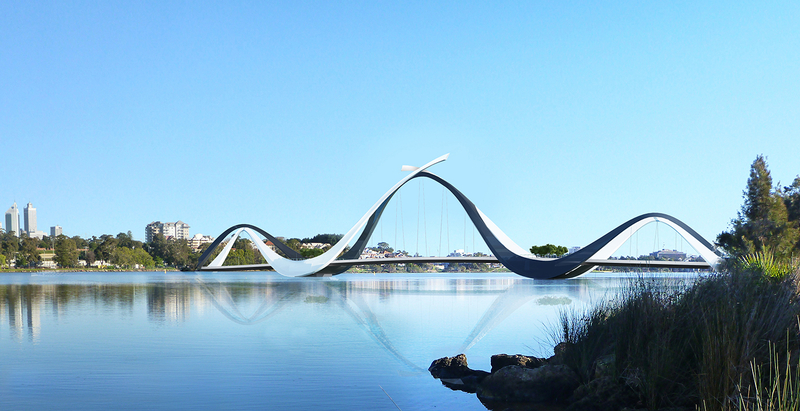 Parry and Rosenthal Architects assisted Melbourne architect firm, Denton Corker Marshall, in the design of the new pedestrian bridge over the Swan River. It is located between the Burswood peninsula and the Nelson Avenue Special Events Bus Stand in East Perth. As local Perth based architects, Parry and Rosenthal Architects were an integral part of the design team, liaising with a diverse stakeholder team. These included the City of Perth, Metropolitan Redevelopment Authority, Swan River Trust, Public Transport Authority and Western Australia Planning Commission. The brief was complex with an overriding aim to create excellent and innovative urban design that reflects Perth’s ‘sense of place’ as well as being a spectacular gateway to the new Burswood Stadium. The design for the new pedestrian bridge offers a high level of pedestrian amenity. It engages with the surrounding natural and built landscape, using a sequence of unfolding views and vistas. It makes a dynamic contribution to its context by addressing the City, Swan River and the new Stadium. As a civic landmark, the new pedestrian bridge offers a distinctive character and a structurally expressive form with elegant proportions and scale. Designed to be friendly to both pedestrians and cyclists, the experience of crossing the bridge is safe and memorable, and provides universal accessibility for all levels of mobility. High quality materials and detailing are utilised to achieve civic character, durability, ease of maintenance and whole-of-life value for money.